Fabulous Barcelona is the cosmopolitan capital of the Catalonia region of Spain. This city has the most amazing architecture and wonderful art works. There is much to explore and see like the awesome Gothic Quarter. So let us take a look at some of the highlights of this amazing city. In Barcelona you’ll be able to marvel over Antoni Gaudi’s unfinished masterpiece the Sagrada Familia. This counts as one of the most popular tourist attractions in the city. This impressive neo-Gothic church was designed by architect Francisco de Paula del Villar and he led the construction that began in 1882. 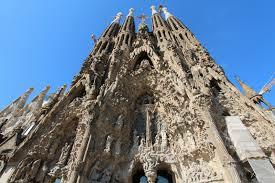 A year afterwards Antonino Gaudi took over and he devoted most of his life to the construction of this church. He changed the design drastically and from the neo-Gothic it went to his trademark modernist style. When Gaudi died in 1926 only the Nativity Facade, one tower, the apse and the crypt were finished. With time this church has expanded and grown but is still being constructed and when it will be finished it will have eighteen towers. Four towers on each of the three facades represent the twelve apostles. Another four towers represent the four evangelists and these will surround the largest tower, dedicated to Jesus. The last tower, dedicated to Virgin Mary, is to be built over the apse. There will be three facades – Gaudi completed the first the Nativity Facade, the second is the Passion Facade and the third and main facade is the Glory Facade. This church is well worth a visit. Visitors can visit Gaudi’s crypt and the central nave with its giant, tree-like pillars. There is a museum that tells the history of this church and of its great architect. You can also visit the towers where an elevator and a long walk lead you to the top of a tower from which you can get fantastic views of Barcelona. In the heart of Barcelona the Gothic Quarter you’ll find the magnificent Gothic Cathedral, known as La Seu. 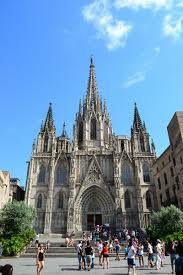 This church was named after the city’s patron saint Eulalia and the name La Seu that is most often use refers to the status of the church as the seat of the diocese. The church is 93 m long and 40m wide and its octagonal bell towers exceed a height of 50m and were built between 1386 and 1393. The central tower spire is 70m high. The main entrance to the cathedral is decorated with statues. Inside is one wide nave lit by large, fifteenth-century stained glass windows it is flanked by aisles with 28 side chapels. One highlight of the church is the crypt beneath the Capella Major housing the sarcophagus of Saint Eulalia. At the center of the nave is a lovely choir with intricately carved choir stalls and the enclosure around the choir is decorated by reliefs narrating the life of Saint Eulalia. This cathedral is best known for its fourteenth-century cloister that has a central courtyard surrounded by a wonderful Gothic portico. In the courtyard there are always thirteen geese. Each goose represents one year in the life of the martyr Saint Eulalia, was a 13-year-old Roman Christian virgin, who suffered martyrdom during the Christian persecution in the reign of Emperor Diocletian. There is also a museum displaying precious liturgical artifacts. 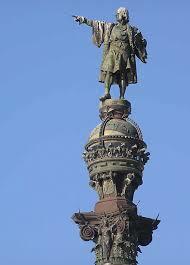 The Christopher Columbus Monument was built in 1888 in honor of the renowned explorer. The statue of Columbus stands on a tall cast-iron column in the middle of the Square of the Gate of Peace. It stands on a stone pedestal decorated with statues. This statue overlooks the sea and can be seen from a distance. 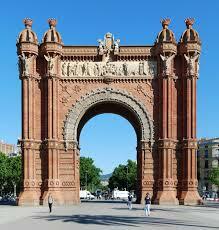 The monument was designed by Catalan architect Gaieta Buigas i Monrava for the Universal exhibition of 1888. It stands right at the spot where Columbus arrived in 1493 after having discovered America the previous year. The statue itself was created by Rafael Atche. Visitors can enter the monument and take an elevator to a platform from which there are fantastic views over the Rambla Port Vell (the city’s oldest obsolete harbor). 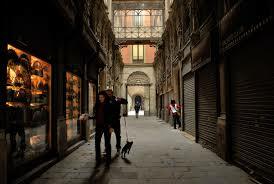 Take the time to wander through the lovely neighborhood called the Gothic Quarter that was once a Roman village. There are still some remnants left. Here are marvelous narrow, winding streets taking you back into history. It offers many peaceful squares for relaxing. 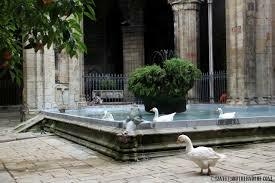 Its main attraction is the previously mentioned Gothic Cathedral and courtyard geese. Around Reial Square are lots of restaurants and bars lively both day and night. For shopping there are lots of little boutiques to explore. The National Palace – originally built as the central pavilion for the International Exhibition. 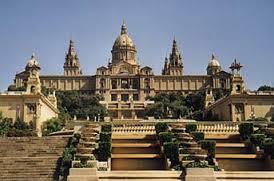 This impressive building was built in neo-Baroque style and is home to the Museu Nacional d’Art de Catalunya. The art collection here consists of Roman, Gothic, Renaissance and Baroque art as well as 19th and 20th century art work. Magic Fountain – located in front of the National Palace and was also built for the exhibition. At night both the palace and the fountain are illuminated. 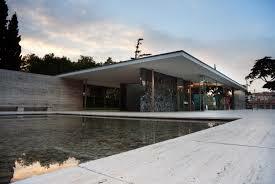 Next to the fountain you’ll find the Pavello Mies van der Rohe designed by Ludwig Mies van der Rohe. It was the German pavilion at the exhibition in 1929. Even though the original building was destroyed being one of der Rohe’s most influential works it was reconstructed in the 1980s. It is a most impressive glass and marble building. It’s wonderful to see another exhibition remainder the Spanish Village, a collection of houses in different Spanish architectural styles. It has become a popular tourist attractions. Here you’ll also find the Olympic Ring consisting of sports facilities built for the 1992 Olympics. At the center of the ring is the Olympic Stadium. 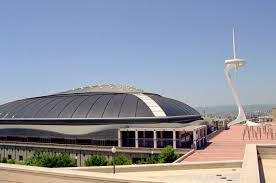 There is also the Olympic Tower built by renowned Spanish architect Santiago Calatrava. The tower was built in a curved white style and used as the main communication tower for coverage of the Olympic Games. There are the lovely Montjuic Gardens and among the most interesting ones are the Nou Jardi Botanic, a botanic garden with over two thousand kinds of plants and the Jardin de Mossen Costa i Llobera with hundreds of different kinds of cacti. 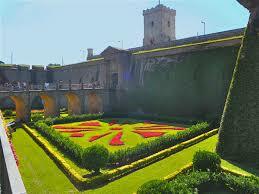 The oldest sight here is the Castell de Montjuic an 18th century fortress built by the Bourbons. The castle is used for cultural activities and it can be reached by funicular or cable lift. The Arc de Triomf is a triumphal arch that was built with colorful bricks in Mudejar Style and designed by the Modernista architect Josep Vilaseca. It is adorned with lots of statues and reliefs. This arch was also built for the Universal Exposition and it was situated at the end of a wide promenade and was the exhibition’s main entrance. The arch stands 30m tall and is decorated with stone carvings and ceramic tiles. The front frieze designed by Josep Reynes depicts Barcelona welcoming visitors, the frieze on the right was created by Antoni Vilanova and symbolizes industry, trade and agriculture and finally the frieze on the left created by Torcuato Tasso symbolizes the arts and trade. The arch is embellished with a stone carving of the Spanish coat of arms flanked by two roaring lions and topped by a crown. Along the contour of the arch are the emblems of all provinces and the arch is also adorned with twelve allegorical statues of women, symbolizing fame. 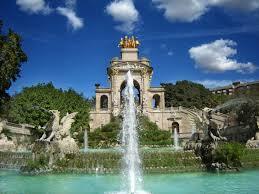 Residents and visitors alike love to relax and stroll in the Parc de la Ciutadella, Barcelona’s central park. The park has wide promenades, many colorful flowerbeds and lots of palm trees. There are delightful fountains and sculptures and even interesting buildings. Parc Zoologic – the zoo is the most popular attraction offering around 7,500 animals representing four hundred different species. Here you can see such animals as gorillas, orangutans, dolphins, cheetas, wolves, snow leopards, crocodiles and alligators. The Cascada – in the northern corner of the park is this triumphal arch with a waterfall and fountain. Its Baroque construction was designed by Josep Fontsere and the design was loosely based on the famous Trevi Fountain in Rome. Within the park you’ll also find the Museum of Natural Science consisting of the zoology museum of Barcelona and the museum of geology. The park also has other interesting buildings and statues and a lake for dreaming. As you can imagine there is plenty more to do and see in Barcelona a city you’ll want to include in your travels if you head for Europe. Glad you enjoyed this tour of Barcelona Souldiergirl.